Ganga Beach Resort is a three star beach resort, a leader among Hotels and Resorts at Rishikesh, with an extra touch in style, comfort and service. Ganga Beach Resort offers various romantic honeymoon packages, weddings, exciting adventure tours, superb cuisine, and comfortable rooms, all with great Ganga view and surrounded with the captivating magic of the forests in Rishikesh. The Ayurvedic treatments at this hotel are strongly embedded in ancient traditions, while keeping in mind preferences and comforts. The Ganga Beach Resort provides you the yoga treatment as per Panchkarma. The pleasure of spa massage can be enhanced by soothing relaxing music, which simply makes superb combination. You can take a package that includes spa treatment at Ganga Beach Resort. Ganga Beach Resort is resort located on the Banks of River Ganges at Rishikesh (Uttarakhand, India). It is located between Ram Jhula and Laxman Jhula on the Badrinath Road in the Heart of Rishikesh at a strategic location that allows all visitors to feel the natural hill beauty of the place. Ganga Beach Resort is just 3 Km away from the Rishikesh Main City, surrounded by Mountains and on right on the bank of River Ganga. The Ganga Beach Resort is situated at crest of mountain and offers you picturesque view of the valley and city of Rishikesh in Uttarakhand. It has well designed and customized Cottages, Rooms & Suites with wooden floors and stuff. 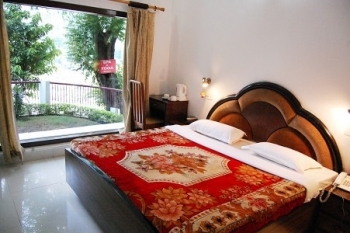 The main feature of this hotel is private terrace to view exquisiteness of the Rishikesh. 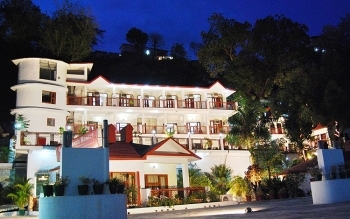 The Ganga Beach Resort has various Cottages, Rooms, and Suites including two Royal Suites. Guest can lose them in comfort in our hotel in Rishikesh. All of these open onto meticulously landscaped gardens and the Ganga. You can enjoy the spacious comfort of impeccable quality and amenities in our hotel in Rishikesh. Deluxe Rooms: offers breathtaking view of holy river Ganga. Cottage: Peaceful environment besides Ganga is the phrase that perfectly elaborates upon a cottage. Executive Rooms: well furnished rooms with perfect virbrant aura. Luxury Executive: Luxury executive rooms are embellished and ornamented with ultra modern faclities to please the corporate professionals. Family Cottage: Ecstacy delivered to you with strengthened family ties in the Family cottage as you relax in the vicinity of Ganga with your near and dear ones here. Royal Room: This define the real luxury clubbed with the incredible beauty of nature. The Ganga Beach Resort provides you a wide selection of delectable dishes and refreshing drinks. The Resort has the perfect ambience for a dining out experience. At the Resort, multi-cuisine restaurant serves North Indian, Continental, Garhwali, Mughlai and Chinese food in their authentic flavors. The Resort's decor is magnificent and designed to provide you the most personal space in hotel. - Ganga Beach Resort has a strong belief in quality and standards since inception and has maintained them with complete zest and zeal in absolute professional manner. - Welcome with Traditional Tilak with Masala Tea. - Photo for a Couple with a view of Holy River Ganga. Check-Out - 1200 Hours. Later check-outs are available on request and are subject to availability. If arrival time is not mentioned, the reservations will be released at 1800 Hrs. our Delhi office. All major credit cards are accepted. Ganga Beach Resort is just 260 kms from New Delhi. The Resort is situated at Tapovan 3 Kms from Rishikesh and just on the right of river bank along with the coastal line of river Ganga. It is 3.5 Km from Rishikesh Railway Station and Bus Stand. 25 Kms from Haridwar Railway Station Rishikesh is well connected with various trains Delhi and other cities in Northern India.